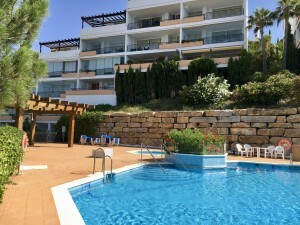 Modern and stylish 3-bedroom penthouse apartment with amazing views and features to ensure luxurious and comfortable living. Spacious living and dining area that opens up to an oversized terrace with plenty of space to enjoy sunbathing and dining in private. The kitchen is open and fully fitted with high end appliances, neutral tones are used to create a serene and stylish feel and the floor to ceiling windows allows an abundance of natural light to flow in. The private solarium has a jacuzzi and space for a barbecue area. Private parking and storage included for your convenience. The communal areas are fabulous for all ages, relax and rewind in a Balinese sun lounge, have a morning swim in the large pool and for the kids there is plenty of gardens to roam around in and a playground to meet new friends. For golfers there is plenty of well know golf courses close by and a tennis and public sport centre close by is available. 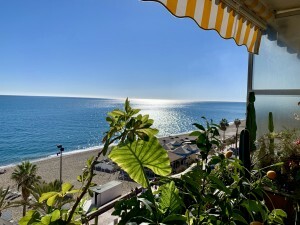 Restaurants, bars and shops are within walking distance and it is only a short drive to the beach, Estepona and Puerto Banus.